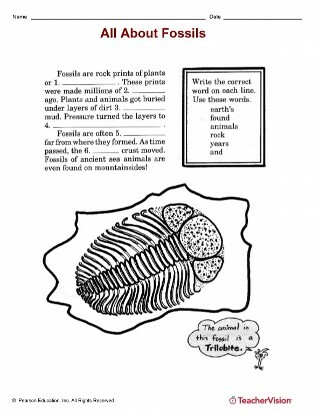 This printable science activity focuses on fossil facts, allowing students to learn about fossils by writing vocabulary terms to complete a series of sentences about how fossils are formed. Students are shown a picture of a trilobite fossil in reference to the concept that fossils from the ancient sea floor are often found in places that are no longer part of the ocean. This worksheet can be used as an in-class activity or as a homework assignment, and is appropriate for early elementary grades.